Nothing huge to pass along today but there are a number of minor updates to the UMass coaching search. First, USHR reported late yesterday that Boston College assistant Mike Cavanaugh has officially withdrawn from the search. While USHR did not attribute the quote directly to him the story did say that “potential candidates are frustrated” by the search process. It’s unknown how seriously Cavanaugh was considered as a candidate, despite having top notch qualifications. Though FTT did report earlier that he interviewed for the position, subsequent reports have suggested that he may have only talked with John McCutcheon over the phone for the position. It does not appear there was ever a face to face meeting or a tour of campus. So, despite qualified candidates getting fed up with the process and dropping out, Athletic Director John McCutcheon told the Republican’s Harry Plumer that he is “following a process that’s worked in the past” (guessing he’s not referring to the Kevin Morris hire) and that there is no timeline to hire a new coach. He goes on to say that while three weeks have passed since Toot Cahoon stepped down that it really hasn’t been a long time and that “this hasn’t been very different from any other search.” Maybe, but the problem is that this search is taking place in July. Yes, a three week or more search isn’t out of the ordinary….in March. The players hit campus in less than five weeks according to reports. It’d be nice if they had a coach who has actually been able to settle in, maybe unpack his office, and decide upon the new direction for UMass hockey by the time they get there. Time is a luxury during most offseasons. It’s not now. The clock is ticking. You cannot treat this like “any other search”. Give it your full attention and get it done. Next up, I did receive news that current assistant Len Quesnelle formally interviewed for the head coach position today. Quesnelle of course has been retained by UMass from former coach Toot Cahoon’s staff and at the very least would serve as a bridge to a new regime. Given how the search has played out and who has been offered, I don’t see why he shouldn’t be considered seriously. Quesnelle has played a big role in the success of the UMass program and has the character and personality to lead a program. USHR also reported tonight that USHL head coach Mark Carlson has emerged as a “strong” candidate for the position. Carlson has spent the last 13 years as the head coach/GM of the Cedar Rapids Rough Riders with a ton of success. Current Minuteman Darren Rowe played for Carlson at Cedar Rapids as well as former Minutemen Casey Wellman and David Boehm. Honestly, I like the idea. I think early in the search McCutcheon was discounting head coaching experience in the developmental leagues. That’s a mistake. USHL hockey is not AAU basketball or high school football. It really is a mini-college type atmosphere. Except they play a ton more games. Overall it’s very relevant experience. Plus he has assistant coach experience at Lowell and Northeastern. The only knock on Carlson? He went to one of those lesser UMass campuses. Matt Vautour has a short blog post about Carlson as a candidate. He brings up a good question about ownership in his current junior team and what that would mean. Nothing too groundbreaking. But Meloni did Tweet later that in speaking with players that the support for former assistant Red Gendron is growing. We’ve heard a lot about what us fans think about the coaching search but haven’t heard too much about how the players are faring in this situation. Personally I heard from a couple different people close to the players today. Overall they’re doing probably better than you could expect. I’m told they’re rallying around each other and the team and are ready to take on all doubters when the puck drops in October, no matter who is behind the bench. Whoever is ultimately hired will be in the beneficial situation of inheriting not only a deep and talented group, but a very close team. One that’s growing closer with each day of this drawn out search process. I honestly cannot wait until I can start writing about players and the prospective season on this blog rather than the athletic administration and the coaching saga. Washington Capitals Development Camp has begun and there are a couple familiar names participating. First is T.J. Syner who signed with the Caps after finishing his season last year and then played the rest of the season in Hershey of the USHL. The other name familiar to the old triangle era UMass fans is Jaynen Rissling. That’s not the former UMass captain however, it’s actually his nephew who was selected in the 7th round of the NHL draft. Colby College made official former Graduate Assistant and Directory of Hockey Operations Chris Hall becoming an assistant coach to Blaise MacDonald up a Colby College. As I’ve said earlier, this a great news. I’ve been very impressed by Hall in my interactions with him. I’m sure I speak for all UMass fans when I wish him luck in this new endeavor and thank him for all he contributed to UMass hockey. Who knows, maybe he’ll be rumored in some future head coaching search. Lastly, UMass hockey fans do a lot of different things to keep themselves busy during the Summer waiting for the next season to arrive. Some follow the Red Sox (sorry). Myself, I like to brew my own beer. Some people sit around and watch DVDs of the 2007 win over Clarkson in the NCAA tournament. Ok, that’s me too. But this past Saturday I got to got to watch how diehard UMass hockey fans Rob Thompson and Bruce Clark spend their summers, going fast on the pavement of Monadnock Speedway in New Hampshire. I’m glad to call these two guys friends after hanging out in Section U over the last few years watching the UMass hockey team battle the best of Hockey East. It was great this past weekend to finally see them enjoying their passion of racing, probably one of their few interests to eclipse their love to Minuteman hockey. I did notice some very blatantly obvious empty space on their cars that would be great for a UMass hockey logo. 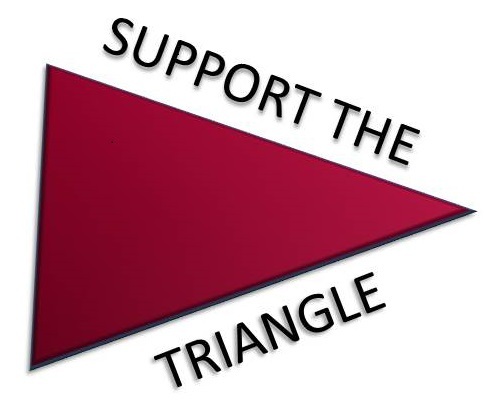 Or maybe one for Fear The Triangle? Just saying. Will be happy with either candidate, Carlson or Gendron. Short term red is the much better candidate IMO but overall and with the potential recruiting in the USHL Carlson is very intriguing.